S100 I/O communication is realized in AC 800M by communication interface CI856, which is connected to the CEX-Bus through a base plate. The baseplate, TP856, houses a ribbon connector connecting to bus extender boards in S100 I/O racks and provides a simple DIN-rail mounting. Up to five S100 I/O racks can be connected to one CI856 where each I/O rack can hold up to 20 I/O boards. 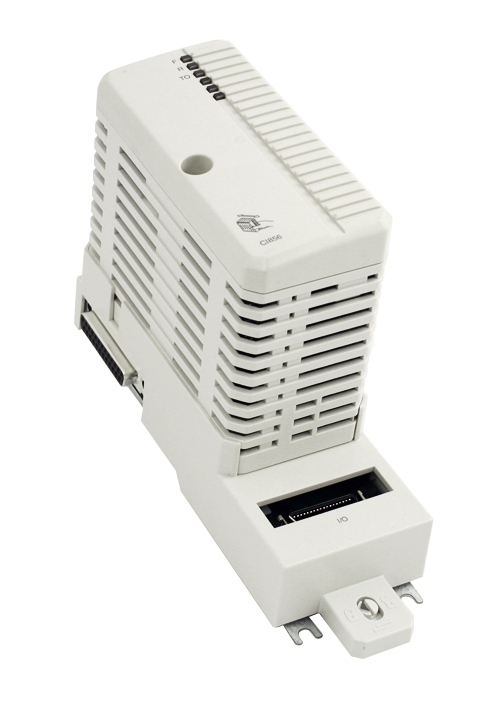 The CI856 is powered by the processor unit, via the CEX-Bus, and therefore does not require any additional external power source. A key benefit with the CI856 interface is the possibility to reuse the majority of the existing I/O installation, including terminations and field wiring in existing ABB Master and Advant OCS installations.